Despite a 24.8% decline in iPad shipments year-over-year, the Apple iPad was still on top with a leading 24.5% share of global tablet shipments during the fourth quarter of 2015. Apple shipped 16.1 million slates from October through December. The tech titan was led by its new business-centric Apple iPad Pro, which carries a 12.9-inch display and a powerful A9X chipset. 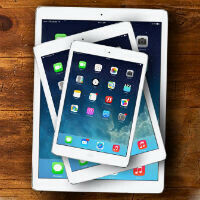 Research firm IDC believes that Apple sold 2 million units of the tablet during the initial quarter of its launch. That outsold the 1.6 million units of the Surface Pro 4 and Surface 3 that IDC estimates Microsoft sold during the same period. Following Apple, Samsung was next with 9 million tablets shipped during the quarter. That gave Samsung 13.7% of the global tablet market during the period. Year-over-year, Samsung's Q4 tablet shipments declined by 18.1%. With a stunning 175.7% rise in year-over-year tablet shipments to 5.2 million from 1.9 million in 2014, Amazon was third with 7.9% of the global tablet market. Lenovo (3.2 million units shipped) and Huawei (2.2 million units) rounded out the top five. Overall, 65.9 million tablets were shipped during the quarter. That was down 13.7% from the 76.4 million that were delivered during the fourth quarter of 2014. For all of 2015, Apple was the top tablet vendor with 49. 6 million units shipped. That amounted to a 21.8% decline from the 63.4 million iPads Apple had in transit during 2014. Samsung was next, delivering 33.4 million tablets during 2015. That was a 16.1% decline for the year, and left the manufacturer with a 16.2% slice of the 2015 global tablet market. Lenovo shipped 11.2 million tablets during the year, giving it 5.4% of the market. Asus (7.1 million, 3.4%) and Huawei (6.5 million, 3.1%) complete 2015's top five. For the year, 206.8 million tablets were shipped, down 10.1% from the 230.1 million that had been delivered in 2014. Did other iPads count as tablets? See what I did there? Must not be 'Murican. If so, must be from West Virginia or Kentucky. Amazon released some cheapo $50 tablets. Maybe thats why they increased in Sales. What would be a lil more interesting is to see the increases, declines in tablet market share since the iPad launched. Was there even a tablet market before the iPad? Before the usual crowd chime in - I know tablets were available, but no-one bought them. Whether it's liked or not the iPad made the tablet market. No, there really wasnt. But its interesting that even in markets Apple helps jump start or even create if you wanna say that....eventually others come along and capitalize on it just as good or better than Apple. To me it seems Apple goes through periods of getting stale, stagnant. Resting on laurels. Then others come along and take advantage of it. Apple is a dud or 2 away from becoming like Nintendo....they better be careful. iPad/tablets aren't subject to annual upgrade...so at some point sales curve had to stop climbing.